Of course, there are many more reasons that folks are stopped and investigated for DWI, but below are the top four reasons that we see the most. By auto accident, we mean everything from a head-on collision to a run-in with a mailbox. More serious accidents will usually generate the presence of officers on scene within a matter of minutes. Officers are usually looking to rule out the possibility of someone being intoxicated as soon as they arrive on scene. Minor accidents where there are no injuries might elicit a call to 911 (when there would otherwise just be a swap of insurance) if the other party involved suspects a DWI. Easy to see that if you’ve consumed alcohol and are involved in an accident, there is a high probability of a DWI investigation. Please note – there is a difference between the two. Swerving is the more blatant failure to maintain a single lane by driving the vehicle all across the road. Weaving, on the other hand, is usually more subtle and sometimes observed within the lane. Regardless, if it’s late at night and a police officer is behind you and observes either of these driving behaviors, the red and blues are probably going to come on and the driver asked to step out of the vehicle for field sobriety testing. The #3 and #4 seeds were probably the top guesses, right? Surprisingly, we see more of numbers 1 and 2 than any other. And they probably weren’t the ones you guessed. I’ve grouped lane change issues because they can vary from the failure to signal a lane change or turn to the failure to make a proper turn at intersection (aka the “wide right” or “wide left” turn.) If you monitor your daily driving (when you’ve consumed no alcohol,) you’ll probably see that you commit many of these types of traffic infractions constantly. You’ll certainly see other people commit them. So, how does that translate to a police officer’s suspicion of drinking and driving? If it’s late at night on a Friday or Saturday, most patrol officers are quick to pull people over for any traffic violation just to check them out and make sure they’re not DWI. We’re not talking 100mph in a 30mph zone, although we have seen some crazy speeds. No, we’re talking general, everyday speeding; 5 or 10 miles an hour over the speed limit. Nighttime patrol officers love to use their speed detection devices to initiate stops to find DWIs. That’s right! Patrol officers aren’t just looking for obvious impaired driving clues. It’s clear from our experience in handling DWI cases in Tarrant County that most officers are suspicious of anyone out late at night (especially on the weekends.) They know they only need a legal reason to stop someone at any given time. And once they establish their legal reason (even if it’s just speeding,) they then get to proceed with the “where are you coming from, where are you going, have you had anything to drink?” line of questioning. Once they get an admission of “yeah, I had a couple” or smell even the faintest odor of alcohol from the vehicle, they then get the driver out of the vehicle and begin the field sobriety tests. And once they start with the field sobriety tests, the possibility of being arrested goes up astronomically – even if you’re not intoxicated! 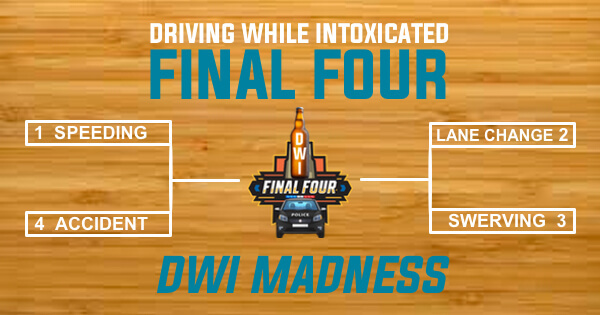 If we were to play out the DWI Final Four tournament, Speeding would be your Texas State Champion. What Should You Do If You Are Suspected of Driving While Intoxicated? – May I Legally Refuse a Field Sobriety Test? 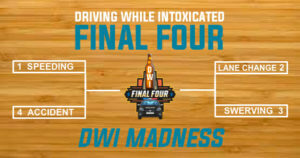 If you have been arrested for DWI in Tarrant County after being stopped for one of these four reasons (or any other reason), contact our Tarrant County DWI attorneys for a free case evaluation.